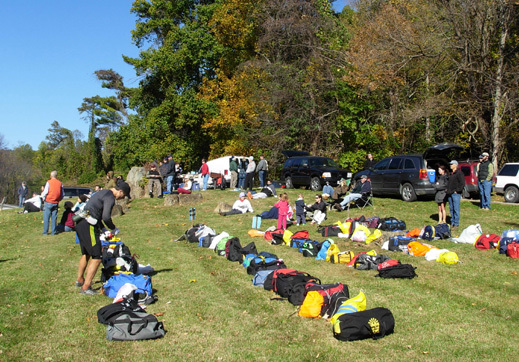 and tried and true organization makes the race a perfect first 50 miler." The perfect first 50-miler?? Yes and no. I was naive enough to run MMTR as my first ultra, not just my first 50-miler. I'd never gone beyond 26.2 miles in a race or 30 miles in training. Some runners thought I was nuts for considering MMTR. Of course, some people thought I was nuts for considering anything over the marathon distance, even a 50K, but that's another story. It was 1992. 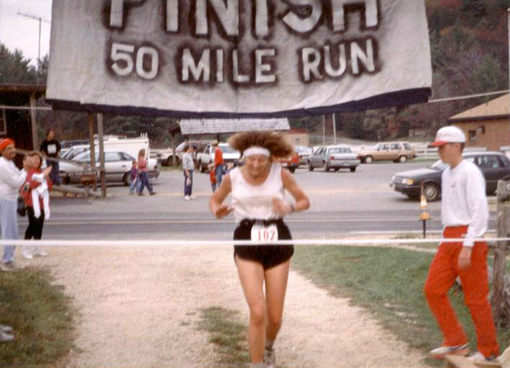 I was living in Atlanta at the time and knew some ultra runners around the Southeast who loved the event. I'd been getting UltraRunning magazine for a couple years, easing mentally into ultra distances before doing the mileage (I feared losing speed more than being able to run that far). I was intrigued after reading MMTR race reports. 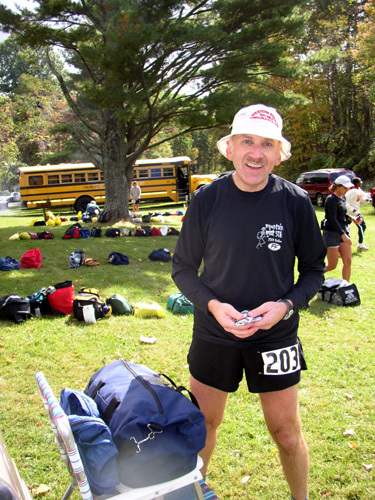 I also admired David Horton's running accomplishments to that point in time, including his record 1991 Appalachian Trail run. 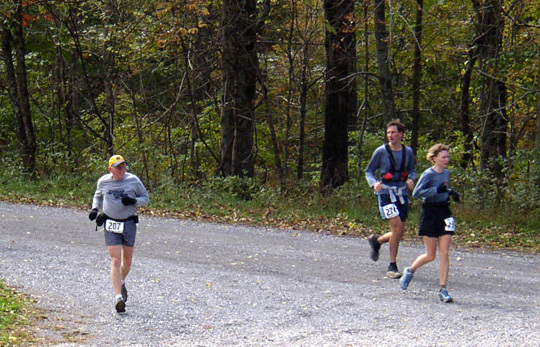 Not only was David an elite-level ultra runner, he was also the nutty race director of this nutty race in the Blue Ridge Mountains west of Lynchburg, VA. So I decided to sign up for the 10th edition of the Mountain Masochist Trail Run. I was 43 years old and totally burned out on road racing. I was a mad-woman for three years after turning 40, competing nearly every weekend in a series of road races in Georgia from 5K to marathon distance. I did well in Masters competition but lacked motivation to continue the requisite speed work to stay at the top of my game. I was finally ready to get into the more laid-back sport of trail ultra races (I'd already been running trails since 1980, just not trail races). It's one of the best decisions I've made as a runner -- not just getting into ultras, but running MMTR as my first one. You see, I was still young enough and fast enough then to finish the doggone thing, something I haven't been able to do since 1998. I ran my best time on the course that first attempt, a 10:30 hour finish that landed me second female overall. There were only seven female finishers that year. I was 80th out of 155 finishers (181 starters). Times have certainly changed. 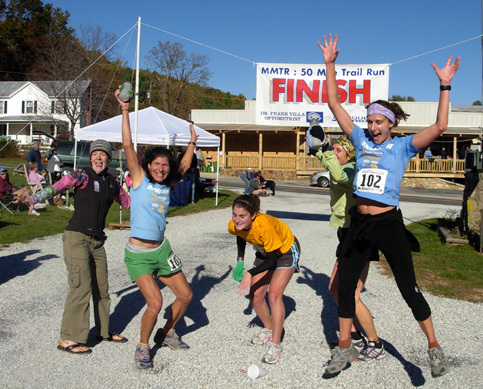 A 10:30 time in the 2007 MMTR placed a woman 29th out of 58 female finishers -- and 226 total finishers. You can see that there are many more women running this race now! "This year we had only 11 women entered versus 31 women in 1991. Where are all our women runners? There were 32 men and no women older than 50 years of age entered. Why are there so few "older" women ultra runners?" I don't even know where to begin to answer David's question about why there were so few "older" female ultra runners who chose to run this race . . . I honestly don't think most elite runners can relate very well to folks in the back half of races. MMTR is a tough course. Yes, there are some very runnable paved and dirt road miles, but the rugged single-track trails are challenging for many runners. As an added treat, the sections with rocks and roots are covered in newly-fallen leaves. (Horton has "Best Blood" awards in all his races!) 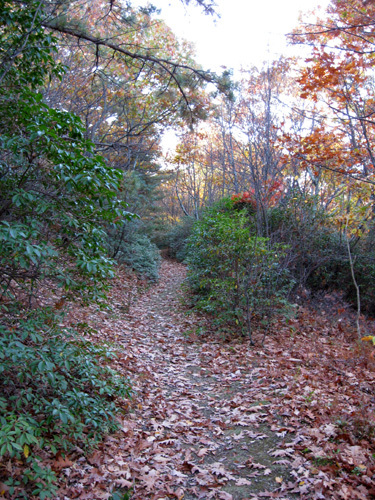 The course has 9,200 feet of elevation gain and 7,200 feet of loss. There are several very long uphill sections. The course is three or four miles longer than advertised, with a 12-hour time limit that is tight for slower runners for a true 50 miles on a less rugged course. There are usually a lot of DNFs. I got curious enough this week to look up some finisher statistics from previous races -- age group records, female finishers over age 50, the typical percentage of DNFs, and such. And one thing jumped out at me, just as it does when I've waited at the finish line for Jim: there sure are a lot of runners coming in between 11 and 12 hours. Although I've always thought this race had tight cut-offs, even *I* was a bit astonished at the high percentage of runners who finish in the last hour! It's as bad (from my perspective) as the Leadville 100-miler, a race notorious for its mad scramble during the last hour. 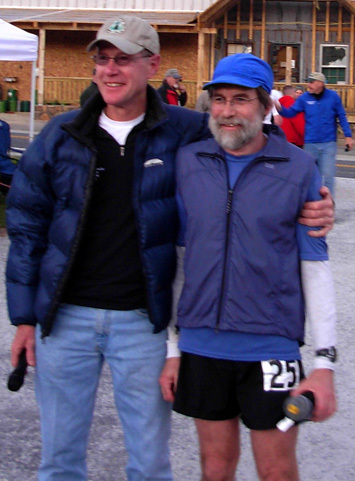 L: David poses with Tom Green at the end of the 2007 race. Tom finished his 25th consecutive MMTR in 11:52, only a few minutes before the cut-off. R: our friend Bedford Boyce, who finished in 11:23. Good job, guys! I couldn't find any stats on David's or Clark's web sites prior to 1996 (the race began in 1983). The number of starters is probably in David's annual race reports in UltraRunning magazine but I'm not going to search for all of those. There are age group records from 1983-2004 but I don't see updated records. 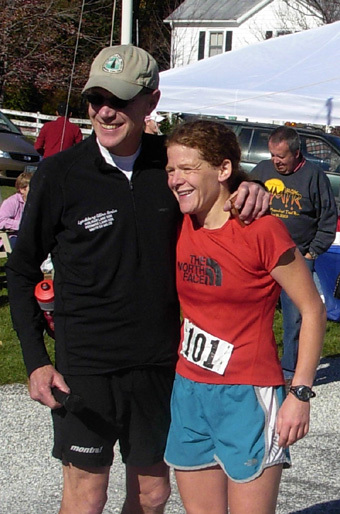 The only course records noted are men�s: Dave Mackey, 2003, 6:48:31 and women�s: Nikki Kimball, 2006, 7:47:05. Nikki with David at the end of the race in 2007. Her 8:31:42 was well off her 2006 record but enough to win the female division. Let's get real: most female ultra runners over "a certain age" know the odds are stacked so high against them in this race that they either don't consider it in the first place or they decide after one or more DNFs that it's futile to try again. There aren't very many different women over 50 who have finished this race, and I don't believe any women over 60 have ever completed it under 12 hours. 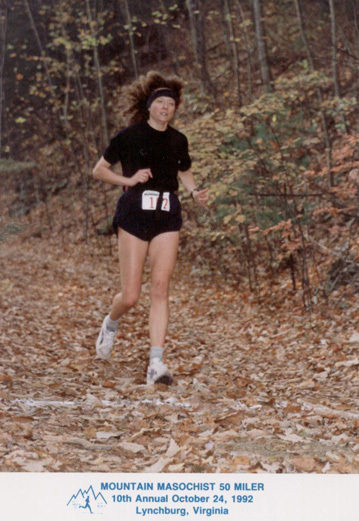 I think Barb Isom is the oldest finisher at 59 (2006 race). I don't have all the race results since 1983; you can see results since 1996 at this link. Ask Anne Huntzinger about this race and how tough it is for an older woman to finish it. She's in her 60s now and has been trying for the last six years to finish her tenth MMTR so she can get the award (a nice jacket) that is given to the ten-time finishers! Anne had eight finishes by 1997 but suffered a broken collarbone and fractured back after being struck by a car six weeks before the 1998 race. She was back in 2000 and 2001 but was unable to make the cut-offs in the second half of the race both years. I respect Anne's tenacity, especially since she flies from the West almost every year for the race. She's registered again this year at age 64 and there's nothing more I'd love than to see her finish in under 12 hours! She'd finally get her jacket and would probably be the oldest female finisher in the race's 26-year history. This is what I meant at the beginning when I said "yes and no" regarding whether MMTR is a the perfect first 50-miler. It all depends on whether you can average a bit over a 13-minute pace on a mountainous course like this, especially if you've never run the distance before. It's a challenge for 50-mile veterans, let alone newbies. Sabrina Moran, Monica Ochs, and Krissy Moehl. You can see lots more 2007 MMTR photos here. In 1992 I was still fast enough to pull it off. 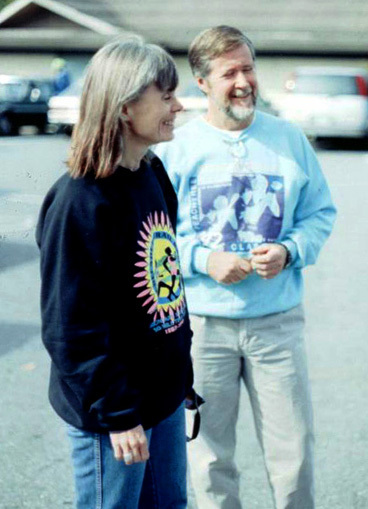 Ditto in 1998 (age 49). I DNF'd in 2000 and have saved my money ever since! (Even if I was fast enough to run it now, I can't because of my bad knees.) It's more fun now for me to crew for Jim, volunteer, celebrate with the happy finishers, and commiserate with the frustrated folks who had to bail out or were pulled for missing a cut-off. I highly recommend this race for those who are fast enough -- or almost fast enough. 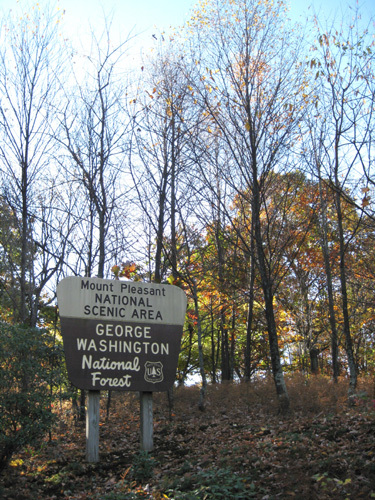 MMTR is a well-organized event that covers absolutely gorgeous mountain terrain during peak fall foliage color in the George Washington National Forest in Virginia. Just be careful if you take your eyes off the trail! There are probably as many veteran volunteers as runners who make this an annual event. Everything about race weekend is first-class. David Horton, his long-suffering wife Nancy, and everyone associated with the race through the years has done a superlative job. After twenty-five years of directing the race, David has turned over the reins to one of his prot�g�s, Clark Zealand (next photo), to direct the 26th edition of the event this year. David is seeded #1 in the race this time. He ran and won the inaugural event in 1983 but has been too busy directing the race to run it since then. He's psyched this year to be competing again. Wouldn't it be cool if he ran faster than he did 26 years ago??? Clark was one of David's students at Liberty University and is now an assistant professor in his mentor's sports management department (David is an exercise physiology prof). Clark is continuing most of the race's traditions and adding some new higher-tech twists to the event: audio on his Eco-X blog, live splits during the race, Twitter Feed with updates, Flickr Photo Stream, and YouTube videos. You can see where the field of sports management is heading -- increasing technology. Here's another race where folks across the country and world can follow the progress of their friends in real time via the internet. Very cool. Jim is #84. Check the link above this Saturday morning or afternoon to see how he's doing. The race starts at 6:30 AM and finishes at 6:30 PM Eastern Time (and don't forget to "fall back" Saturday night/Sunday morning). Jim's next attempt at MMTR was in 2004, the year we moved to Virginia. We live only an hour away from the course -- how could he not run it? 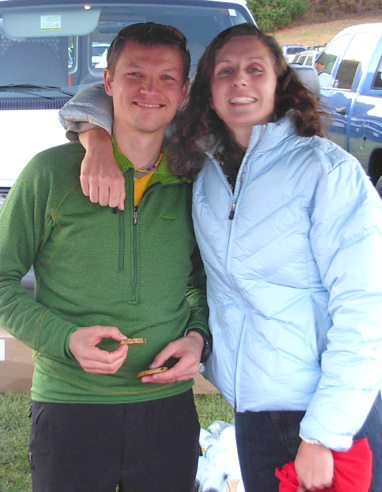 That year he got to the aid station at Salt Log Gap (41.5 miles) in 9:30 hours, missing the cut-off by a few minutes. He wasn't real surprised because it was a strange year in our lives. He retired, we lived in our camper for five months, and we made several out-and-back cross-country trips: from Montana to the Southeast to look for a new home, from Virginia to Billings for our household goods, from Virginia to California for the Western States 100-miler, and from Virginia to Colorado for the Leadville 100. Jim was exhausted by the time MMTR came along. 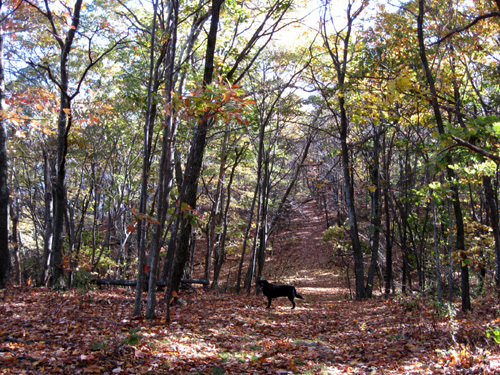 In 2005 Jim was occupied most of the time from the end of April 30 to the end of September crewing for me on the Appalachian Trail. His training was spotty at best, but he signed up for MMTR again. Lo and behold, he got in 45 Horton miles that year -- but missed the cut-off again at Forest Valley. Jim registered in both 2006 and 2007 but did not start (DNS) either race. He just didn't feel prepared either time and didn't want two more DNFs. I can't blame him. We still attended the pre-race dinners and volunteered so we could see lots of friends. Last year Jim swept the last half of the race. Now here we are again, two days before the race, and Jim is psyched to break that DNF streak! I've mentioned previously about Jim's running conundrum this summer and fall -- how to effectively train for relatively flat fixed-time 24- and 48-hour races (Hinson Lake, Ultracentric, and Across the Years) AND for the rougher, much hillier Mountain Masochist 54-miler that falls smack dab in the middle. It hasn't been easy for him, but he told me this week that he feels better trained for MMTR than he has in recent years. That was good to hear. His weekly mileage since the end of September looks like this: 72 miles (including Hinson Lake 24-hour run), 23 miles (rest week), 35, 48, and 9 miles. He's done a variety of flat, rolling, hilly, and mountainous training runs at different paces and strategies. 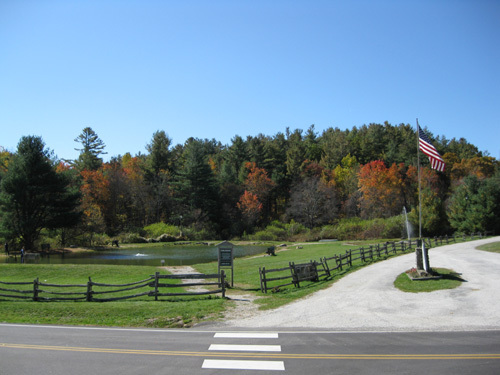 In addition to all the long runs up to 30 miles that Jim ran before and after Hinson Lake, he has done numerous middle-distance hilly runs in the Roanoke area on trails at Explore Park, Mill Mountain, Chestnut Ridge, and Roanoke Mountain. He's also done three long training runs of four to five hours (from 18.4 to 22.8 miles long) on the second half of the MMTR course. One of the more difficult time cut-offs during the race is at Long Mountain Wayside on Hwy. 60. 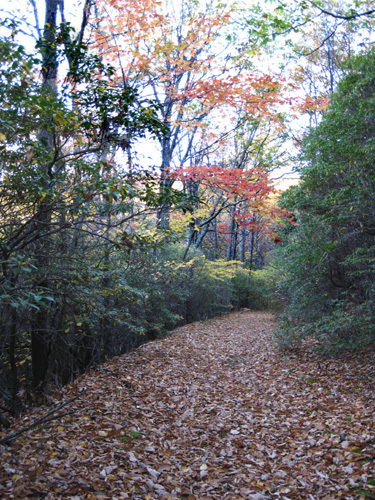 The Appalachian Trail also crosses the road here, but MMTR doesn't follow it (good thing, as it's steeper and rockier than the race course). A lot of runners either choose to drop out at this aid station or are pulled for missing the cut-off. Several buses await their arrival, and it it the only drop bag location. Crews are allowed at several other aid stations, but this is the only one where I've crewed Jim. 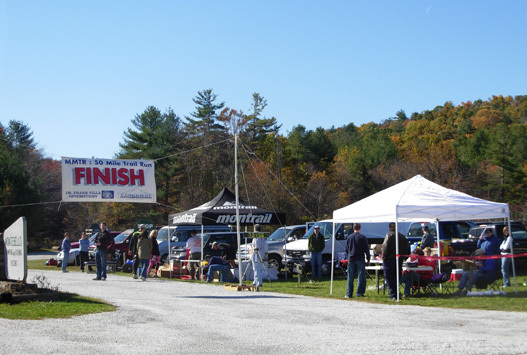 Why would someone want to drop out by choice, i.e., not from being required to stop, at this aid station at 26.9 (official) miles into the race? Half the work is done already, right? HA!! Check out this link for the elevation profile, and you'll see why those buses are so enticing half way through this race! David always warns runners that "the race begins here." By the time runners reach Long Mountain Wayside they are already part of the way up Buck Mountain but it's still an intimidating climb to the next aid station -- and beyond. There is good reason the aid station at the top often plays the theme from "Rocky" to encourage the runners. So Jim decided to focus his three long training runs on the course to the second half. Runs #1 and #2 were at the end of August and the beginning of September -- several weeks before Hinson Lake. Jim parked at the wayside on Hwy. 60 each time and did approximately 19 miles out-and-back on the course: up Buck Mountain on forest service roads to the infamous single-track "Five-Mile Loop" on Mts. 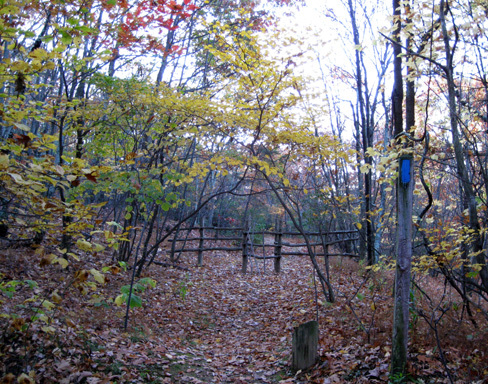 Pleasant and Pompey, highest point on the course, and back down to the wayside. The first time he got some bonus single-track when he missed a turn, but he knew the area well enough to avoid getting lost. The second time he was completely on the race course. Neither time was easy, but both runs were easier than doing the slog to the high points after running half the race first. Jim did both of those training runs alone. Cody isn't trained for 4-5 hour runs right now, and I can't run terrain like that anymore. Even if I could, I probably couldn't keep up with Jim that long. 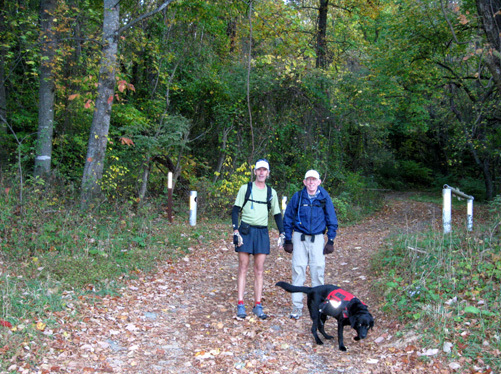 David and Clark scheduled a training run on the second part of the course on October 18. Jim knows from prior experience with these training runs that the predominantly Liberty University students who participate are all much faster than he is, so he's opted out of those runs ever since. He didn't know all the turns but he really, really wanted to run all or most of the second half two weeks before the race. So Jim contacted one of our local friends, Steve Bowles, who is registered for the race again this year. Jim and Steve run about the same pace. Steve promised Jim that he knew all the turns so they could run from Long Mountain Wayside to the finish line in Montebello without getting lost. Just to be sure, they chose the day after the young studs' group training run in hopes that David would leave some markers at critical turns. He did! Jim wrote to thank him later. The guys were originally planning to drive separately and spot their vehicles at each end. Then Jim got a great idea that helped all three of us (four if you count Cody): he asked if I'd crew for them. He knew I'd been in a funk since the New River Trail race and would mellow out in the beautiful mountains and Blue Ridge Parkway. We got to spend more time talking to Steve on the drive up and back. It also saved the boys from having to carry so much fluids and allowed Cody to get in a nice long run. I'm glad I went; it was a lot more fun than running on the greenway by myself yet again. After I dropped Jim, Steve, and Cody off at Long Mountain Wayside (above) I drove several miles on scenic, narrow, winding roads to the Mount Pleasant trailhead at the beginning of the infamous "Loop." I remember the Loop well, even though the last time I ran it was ten years ago. It's one of those seemingly-endless trail segments with "Horton miles" that are longer than advertised. (It's over five miles by everyone's estimates and GPS read-outs.) Clark is maintaining David's legacy in his first year as RD, including all the bonus miles. I made good use of that hour, walking and running down the smooth trail until it turned left and went abruptly up rocky Pompey Mountain. That Sunday was one of those perfect autumn days that is made for trail running: crisp enough to see our breaths in the morning, sunny enough to quickly warm up in the sub-40 degree F. temperatures, and colorful enough to wish October would last forever. The leaves at the upper elevations in these mountains, over 4,000 feet, were nearing their peak. Lower down, they should peak about the time of the race on November 1. The downside to this beauty is all the leaves covering rocks and roots on the course on race day. There were already a lot of leaves on the ground two weeks ago. That day Jim and Steve were mostly on forest service roads and old logging roads where they didn't have to worry about face plants. I returned to the car only a few minutes before Jim and Steve appeared. They were moving along faster than predicted, which was good. I was reading the paper when something caught my eye: it was Cody racing around a corner toward me. He couldn't see me but he knew I was there! He's a great tracking dog. I thought he'd be pooped out but he had tons of energy and kept me amused after Jim and Steve continued on toward Montebello. 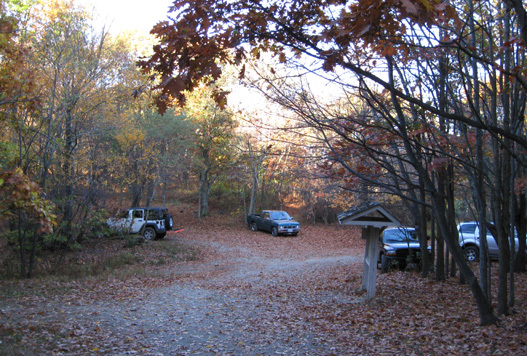 Jim and Steve spent a few minutes at the car to replenish their supplies of fluids and calories, then headed back out to the nearby forest service road toward Salt Log Gap, Forest Valley, Porter's Ridge, and the finish. After they left Cody and I hiked backwards (CW) for a few minutes on the loop up Pompey Mountain; that side is fairly steep and rocky. That wasn't a smart move, although it was fun at the time. 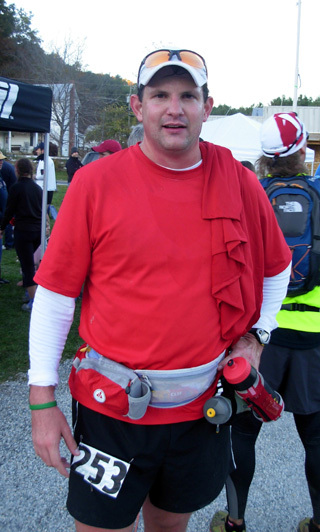 The next day when I was running a steady 10-minute pace on the Wolf Creek Greenway my left hamstring began to "pull" after four miles and I cut the run short to avoid further trauma. It's been a problem ever since. I drove back out to Hwy. 60 and connected with the Blue Ridge Parkway. I always love those parkway miles north to Route 56 to reach Montebello. 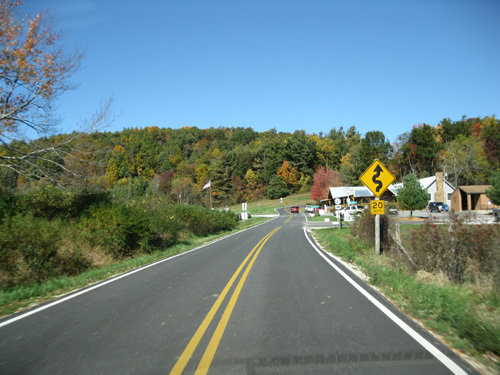 I planned to ride my bike 15-20 miles on the parkway but there were too many leaf-peepers on the road that Sunday to make that any fun. This is the most-visited national park, after all, and I'm happy so many people enjoy it. 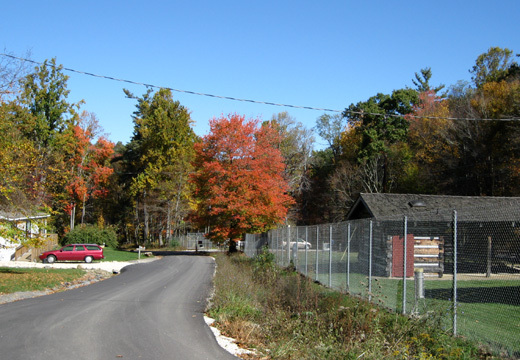 Although the leaves weren't quite at their peak yet, many trees just glowed bright red, orange, and yellow against the bright blue sky. 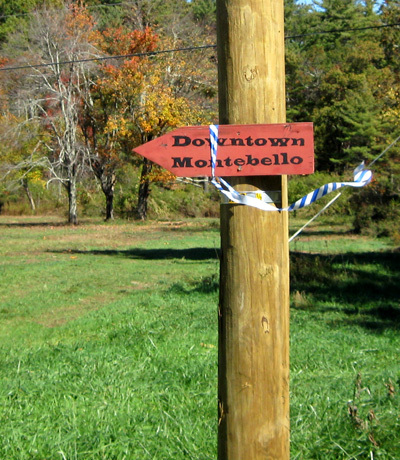 The only things in "downtown Montebello" are a campground and newly-expanded country store! I was hoping for some hot chicken or vegetable soup inside, which is often served post-race to runners, crews, and volunteers, but chili was their only offering on Sunday. Jim enjoyed some after he got done with his training run. I got some points by parking the car past the fish hatchery at the junction with busy Hay. 56, which runners must negotiate to the finish. It's safer during the race, however, because there are cones and signs warning drivers of runners on the road. It would have been more dangerous for Jim and Steve to run it during their training run. They had had enough fun by the time they reached the van that they were happy to not have to run more pavement and play dodge-the-cars. They finished their almost-23 miles in five hours and felt good about the effort. Since the run described above, Jim's been tapering for MMTR. He feels more confident that he can finish the race this year. He's worked as hard as he can for it this time and I know he'll give it everything he's got. He'd better -- folks will be tracking his progress this time! Also look for Steve Bowles (Roanoke friend) and Steve Michael, my running buddy from Atlanta. All three men should have about the same finish time between 11 and 12 hours. Steve Michael is going for his 10th finish this time; that's good motivation to finish.